On those rare occasions in years past when Edinburgh excelled themselves against more exalted opposition, it was never long before they fell back down to earth with a poor result against one of the lesser lights. After their Champions Cup heroics last week against Toulon, their task this week is to ensure that they do not fall back into that old habit when they play Zebre on Friday – and Chris Dean, for one, is confident that they are now psychologically equipped to avoid that pitfall. The scorer of the bonus-point try in the victory over the three-time former trophy-holders on Saturday – a result which he declared, without fear of contradiction, was the team’s “most complete performance of the year so far” – Dean is well aware of the inconsistent mindset that has plagued Edinburgh squads in the past. 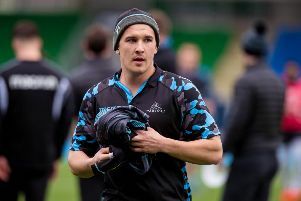 He knows that the absence of so many big names on Scotland duty will be another challenge for those who travel to Parma for the Pro14 match, but believes that Richard Cockerill, pictured, has instilled a more hard-nosed attitude within the players since arriving as head coach for the start of last season. “I guess a few internationals have gone now and won’t be with us this week, so there will be guys getting opportunities that will be looking to really make a mark,” Dean said on Monday after the first training session without the team’s substantial Scottish contingent. “It is very different going from playing Toulon to Zebre, but in the past we’ve fallen at that hurdle. I’ve certainly been a part of it, beating a big team then slipping up the next week against a so-called or perceived lesser team, and that’s now a mindset that we can’t have. “Cockers put that into us this morning and the squad now understand that we’ve got to attack every game with the same mindset every week. So we’ll be going out there to win as well. While that competition is a positive this week, there are clearly difficulties in preparing for a match from which so many regulars are absent. Cockerill was due to learn last night which Scotland players will be released back to him, but the fact remains that when the squad flies out to Parma this morning there will be some who have not had a training session with the rest of their team-mates this week.